A global byword for cinematic quality of a quintessentially British nature, Ealing Studios made more than 150 films over a three-decade period. A cherished and significant part of British film history, only selected films from both the Ealing and Associated Talking Pictures strands have previously been made available on home-video format – with some remaining unseen since their original theatrical release. 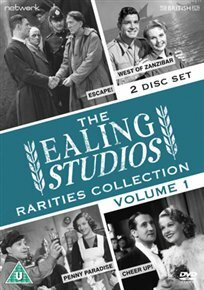 The Ealing Studios Rarities Collection redresses this imbalance. Featuring new transfers from the best available elements, in their correct aspect ratio, this multi-volume collection showcases a range of scarce films from both Basil Dean’s and Michael Balcon’s tenure as studio head, making them available once more to the general public. A study of punitive justice: the fate of a man who has been shut up in Dartmoor Prison and socially ruined. What treatment awaits him when he turns fugitive? An African tribe must seek new pastures. Can game warden Bob Payton persuade them to choose fertile soil and peaceful living over the many temptations of the city? Liverpool tugboat captain Joe spends a weekly sixpence on the pools. When his first mate forgets to post the coupon as a winning line is drawn, comic chaos is the result! Countless comic situations and spectacular dance routines punctuate a tale of two struggling composers trying to gain backing for their musical comedy.